As we continue with the Funeral Home Theme I needed a character to play the old man (Nathanial Barry) who owned it. 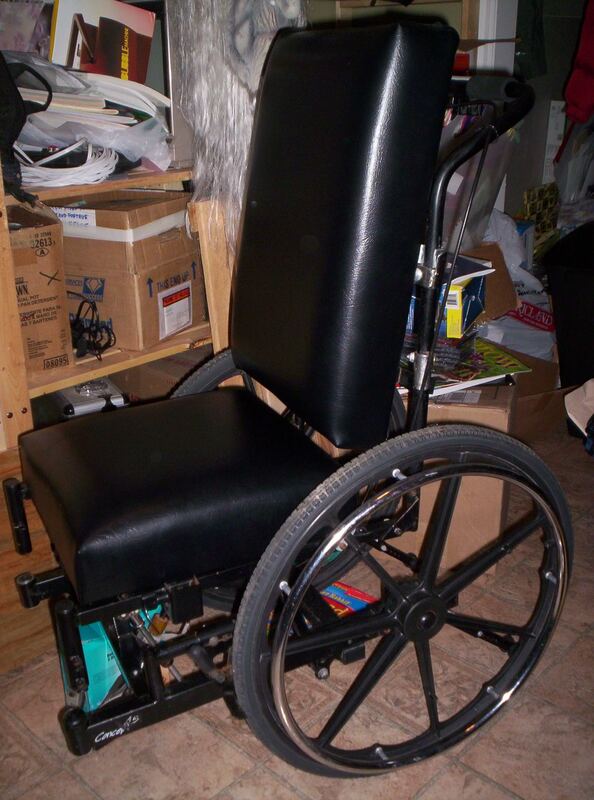 I was in love with Brent Ross’s Cripple prop he used years ago in his show. After communicating Brent and looking at the various pictures I have an idea how to build one of my own. Got all of the pneumatics working this week with the proper fittings finally. 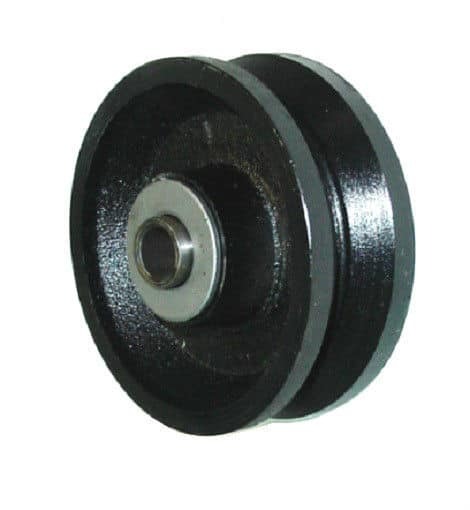 I found a good deal on V-Groove castors to run the wheel chair on a track of angle iron. 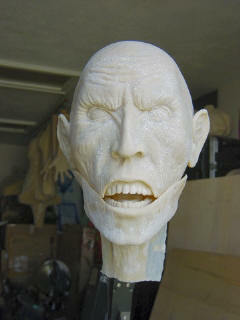 For the body frame I’ll be using Joe Stone’s armature he created years ago based on Distortions “Shake N’ Bake”. I am including the measurements below. After going though my shed and basement I found all the mechanical parts I need to start building. I’ll be using a 2″x36″ Bimba cylinder for move the chair. The mouth will move by a 9/16″ bore by 0.5″ stroke Bimba cylinder. The electric chair motion and lean forward will be achieved via a 1.5″ bore x 1.5″ stroke Bimba cylinder. For the animated figure I wanted to have an old man in the spirit of “The Cripple” of Devious Concoctions. I ordered the head, jaw and arms from Vilethings. If you want to know the cost or order one of these awesome latex pieces I highly recommend you email Vilethings@aol.com and ask. I just have to decide how I am going to animate the mouth. Merry Christmas to me! 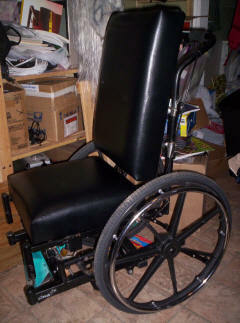 After hauling our holiday trash to the dump and making my obligatory stop at the scrap metal pile I found a wheel chair. 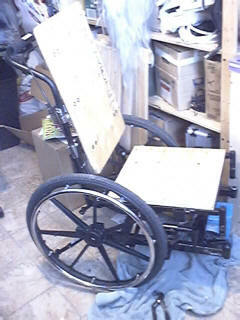 Not just any wheel chair but a mint condition square welded tube Invacare Concept 45 Tilt-in-Place! Retail value $3500! All it is missing is the 2 front wheels which I ordered online for under $50. Today I picked up the cushion from Almada Upholstery. They charged me a nominal per-hour fee and they look great. Just the old-fashioned creepy look I was going for. In hindsight I may remove the seat pads and make it look more old fashioned by changing the wood to slats. 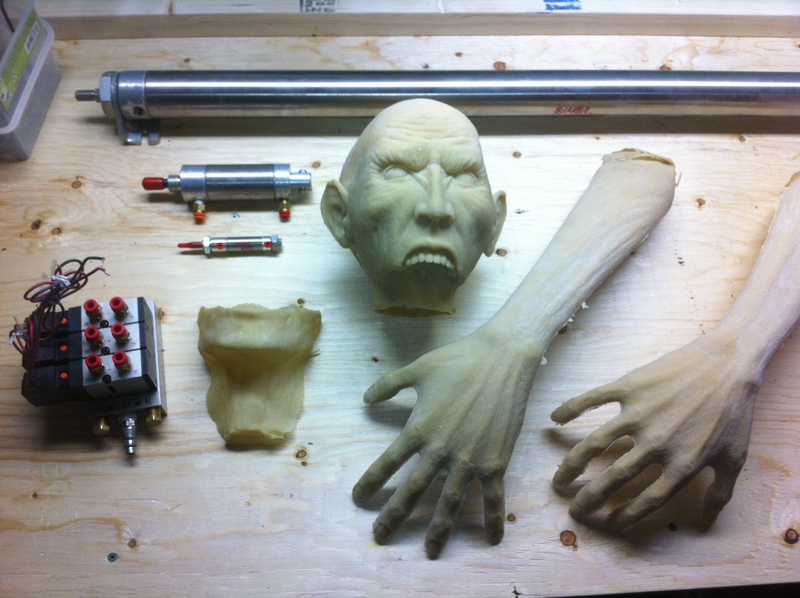 The action of this prop require 3 pistons. This solenoid block should do the trick. I bought 3 of these on eBay and they are very nice and run off 24v so they can be midi controlled. The cripple must move forward and back in his wheel chair. He must lean forward and back and have a moving mouth. I have also decided to use a piston to tilt the chair from a sleeping position to awake. That’s 4 solenoids and pistons now! 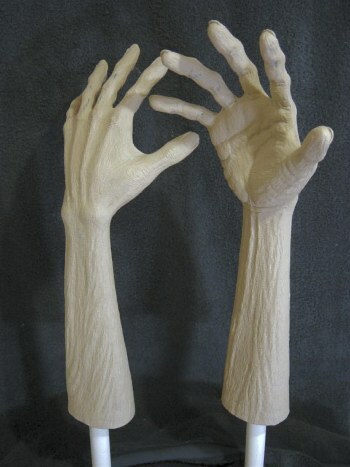 VileThings – Corkus body parts. 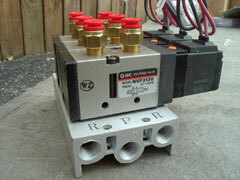 EBay – Best place to get steals on industrial surplus valves and solenoids. Scan with your Iphone or Android!